A dental extraction, or tooth removal, is the complete surgical removal of a tooth. There are two different sorts of dental extraction. A surgical extraction consists of the removal of an undeveloped tooth or a tooth that is, for whatever reason, concealed underneath the gums either fully or partially (such as an impacted wisdom tooth). In contrast, a simple extraction consists of the removal of a ‘regular’ tooth, requiring no incision to extract it from beneath the gum line. When Are Tooth Removals/Wisdom Teeth Removals Performed? A dentist may need to remove a tooth for any number of causes. Teeth that are too detached from their socket, have suffered too much damage to be repaired using cosmetic dentistry, or are too decayed to be salvaged by dental fillings and root canal treatment. 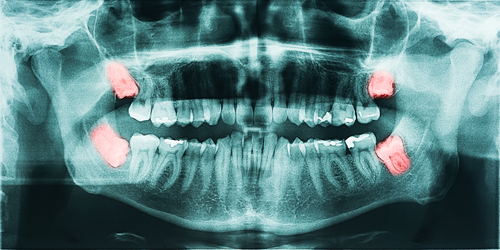 A dentist may recommend wisdom tooth extraction. This is especially true in cases where a patient’s wisdom teeth are impacted, are at risk of being infected, or are causing the patient pain. If a baby tooth is, for whatever reason, not falling out naturally and is blocking the development of a permanent tooth, a dental extraction may be necessary. An extra tooth that inhibits the development of adjacent teeth may need removal. Teeth may develop infections or decay as a side effect of drug or radiation therapy for cancer treatment. If a patient is preparing to receive braces, a tooth may need to be extracted to make room for adjacent teeth that need realignment. Consult your dentist if you have any questions or concerns about wisdom tooth removal or any other dental surgery. Family Dental Care Center serves the communities in and surrounding Lansdowne, Drexel Hill, and Aldan. If you would like to make an appointment, give us a call at 484-791-2138. We also have services if you need a 24-hour dentist. Your specialist will help you assess whether or not you should consider having your wisdom teeth removed. Wisdom teeth are often surgically extracted if they are interfering with the alignment of adjacent teeth, causing pain or gum inflammation, or have a significant risk of becoming infected. For any questions, consult a specialist. How Is Tooth Removal Performed? To determine how to best go about removing a tooth, your dentist will first perform an X-ray to examine your mouth’s shape, general health, and the alignment of your teeth. During a surgical extraction, your dentist will administer general anesthesia, just as any other doctor would during a surgical operation. The dentist will apply a local anesthetic to the gums surrounding the tooth to be removed, so that the gums will be numbed before any incision is made. The tooth in question will be removed through an incision made in the gums. Simple extractions, comparatively, are much easier to perform, and general anesthesia is usually not applied. All that will be needed is a local anesthetic. The dentist will remove the tooth using a pair of forceps in combination with a device called an ‘elevator,’ which will be used to help lift the tooth from its socket. Every patient’s recovery experience will be different, and the time it will take to recover will vary. However, because surgical extractions are much more invasive than simple ones, they tend to have a longer recovery period. Your specialist will advise you on the best regimen concerning diet, oral hygiene, and medication dosage following your surgery. Consult your dentist with any questions. If you are seeking guidance on issues concerning tooth removal, make an appointment today with our team by calling 484-791-2138. Our trusted specialists serve the communities in and surrounding Lansdowne, Drexel Hill, and Aldan.